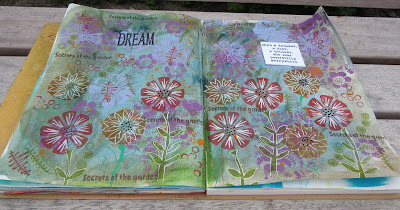 Hi everyone, Ruth here with this weeks inspiration post. I'd only recently heard of Yupo paper and intrigued by it, I thought I'd buy some and have a play. I've only explored it with alcohol inks so far and thought I'd share my results with you. To start with there are a few different types of Yupo available. The SAA was the first one I bought and is lighter weight and less expensive. Ranger also make a translucent one as well as white. 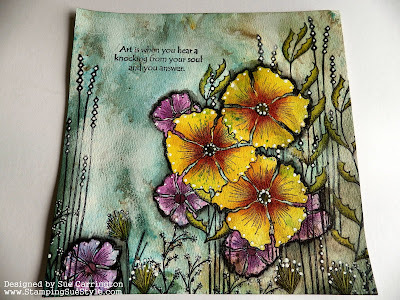 I wasn't really sure where to start with Yupo but after some You tube searching found a few fabulous videos from joggles.com which seemed to be focusing on alcohol inks. The links are below and I own up straight away to saying most of the techniques I've used are from the videos. I'm not going to explain all the step by steps as she does it so well in the videos and offers a wealth of advice so, do check them out. My first experiment was with drops. If you want to do this technique it's important you handle the Yupo as little as possible to avoid any finger oils getting on the paper. The two on the right were on the thinner paper and I did find the drops bloomed better on the thicker paper. Literally you just drop 'drops' on. A cotton bud and isopropyl alcohol was used to shade by stippling and I've attempted a little doodling to create some funky flowers as it is my floral themed challenge this month. Next laying stencils on and using lots of lovely inks. One of the wonderful things about alcohol inks is that you can't make mud, you can blend colours you wouldn't normally and they just don't make mud, you can see this in the first 'drops' experiment as well. 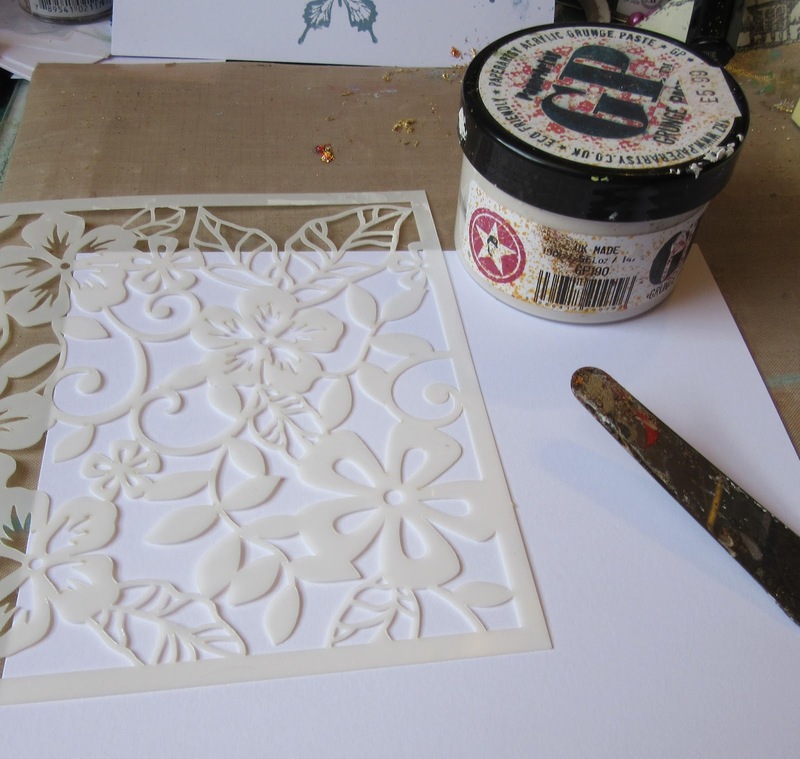 Leave the stencils in place until the ink has dried. 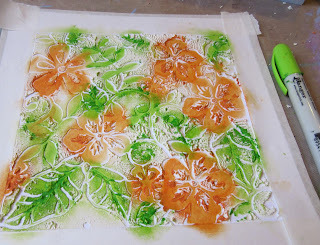 Before I started using the inks on stencils, I put deli paper underneath to catch any drips. The inks go through the deli paper creating some lovely marks, they can be used on cards or journal pages. Any stencils you use will get quite dirty, usually I don't mind but the alcohol can dry quite sticky so I decided to clean them on top of more deli paper with alcohol blending solution...result more bonus papers! Something I did experiment with is the round foam applicator. Normally you use felt on glossy card or Yupo but I thought I'd try something else. I started at one end and went from dark to light using a pouncing motion. There is a lovely quality to the results you acheive on Yupo, very smooth and very forgiving as the inks don't sink into the paper, I really did enjoy playing with these mediums. 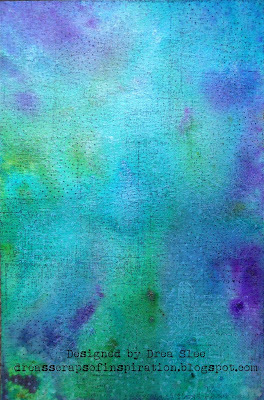 This piece was done on the translucent Yupo and although it's hard to see, it produces a different and lovely effect, almost of more depth. Using a pouncing motion you can acheive stripes and spirals. Pouncing again...as you can see, lots of pretty papers were created. The thinner paper worked beautifully for cards. This piece was stamped with archival ink and then wiped with a dry cloth to reveal the underneath. Some further stamping of a sentiment and I don't think a simple card needs anything else. As the card says...Thanks for stopping by and hope I've given you a little taster of using Yupo if you haven't already tried it. 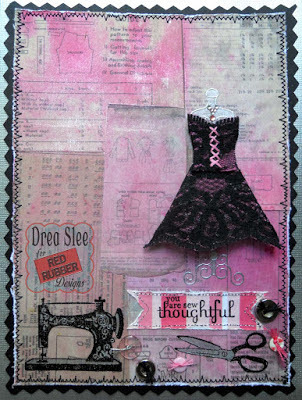 Welcome to today's Guest Designer, Drea ! 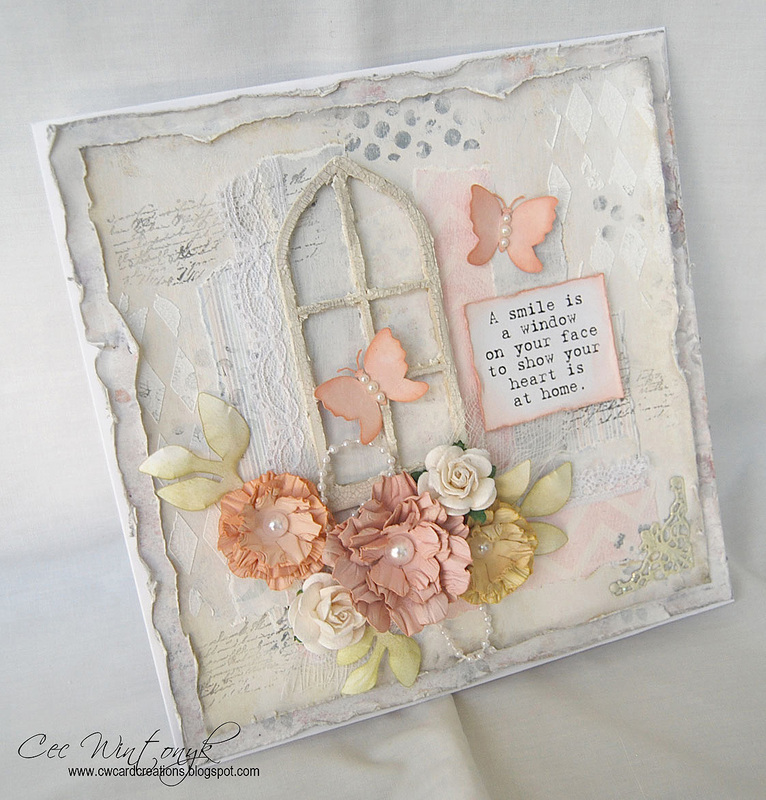 Today we are welcoming another fabulous lady as our Guest Designer. Drea, of Drea's Scraps of Inspiration, was the winner of the Trash to Treasure challenge and was invited to join us for a day. So now it's time to hand over to Drea to share her fabulous project. 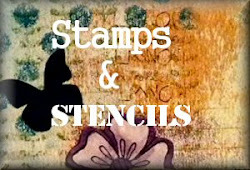 Hello stampers and stencilers! My name is Drea, short for Andrea, and I'm so honored for this opportunity to be a guest designer for this month's challenge. I discovered this fabulous blog just a few months ago, and have found so much inspiration and talent here. I'm from Southern California, but have been living in Reno, Nevada for the last seven years. I'm married to my soulmate for almost fifteen years, and we have an amazing 14 year old son. 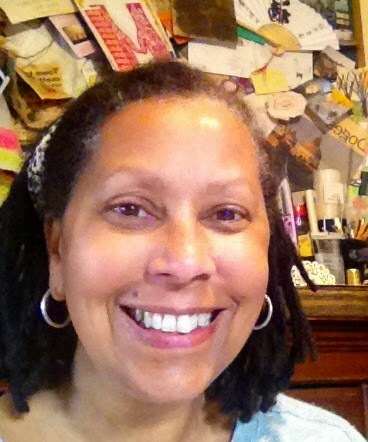 I've always been into arts and crafts, from drawing, painting, sewing, and quilting. I even scrapped as a teenager when the only papers available were 8 1/2" X 11". Then it took a backseat until 2004, and now everything else has taken a backseat. Lol! Although with scrapping I can incorporate most of my favorite hobbies anyway, especially sewing. I've recently been dabbling in mixed media, and love learning new techniques. 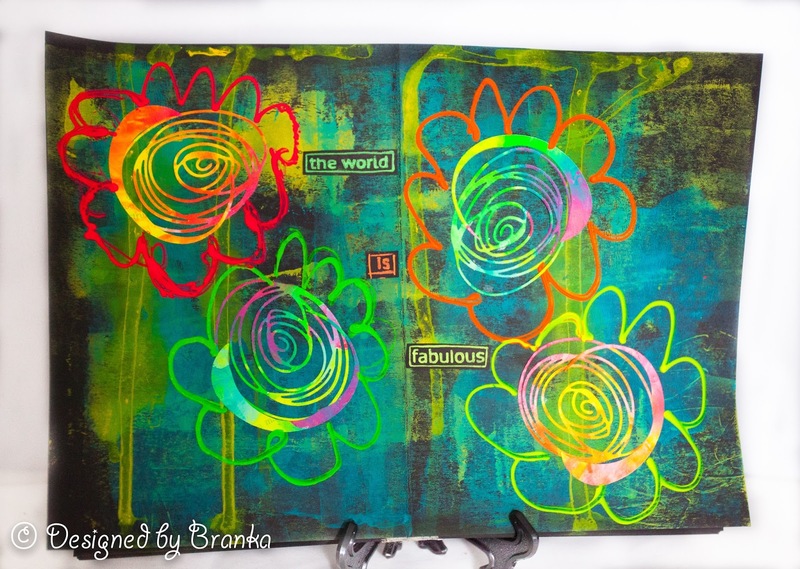 But my passion is colour, and the brighter and bolder the better, which is what inspired my project for the Floral Frenzy challenge this month! 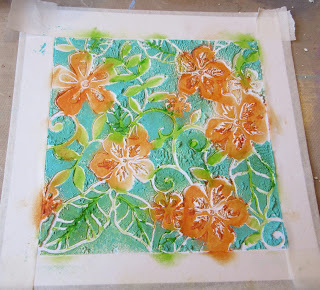 I started with some watercolor paper and Lindy's Stamp Gang Magicals, which I ordered by mistake, a few months ago, thinking it was sprays. As I was curious about them, I decided to keep them, and now I want every color. Lol! First I sprayed my paper with water, and used some old toothbrushes to flick the Magicals (Prima Donna Purple, Drop Dead Gorgeous Green, and Sassy Sapphire) in random spots. 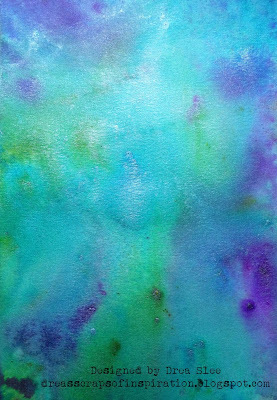 Then I sprayed the Magicals again with water, and turned my paper around to let the colors bleed into eachother. Just a little bit of powder goes a long way, and produces a wonderful shimmer. 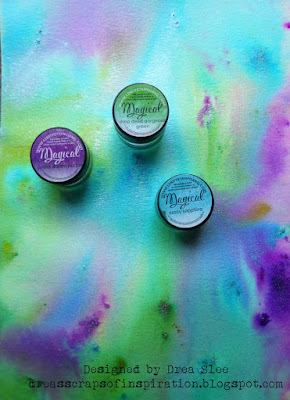 I then spritzed on some more water and Lindy's Stamp Gang Sprays (Witch's Potion Purple and Tibetan Poppy Teal). So glad I used watercolour paper! 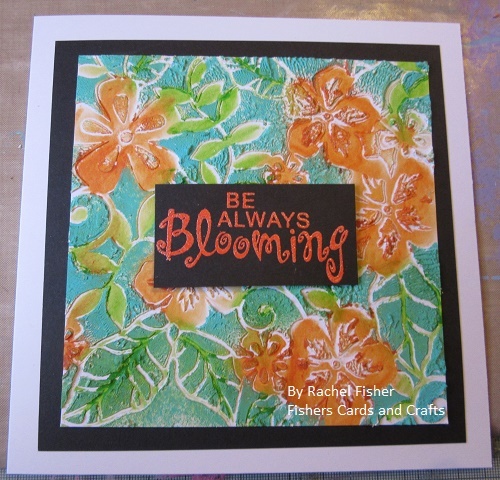 Once dry, I did some background stamping using black ink and Distress Ink (Picket Fence). I used my older black ink pad, as I wanted the black to fade into the background, and not be so dark and dominant. Then I used some black gesso with one of my newest stencils from TCW (Mini Screen Print) all over my page, turning and flipping my stencil in different areas. 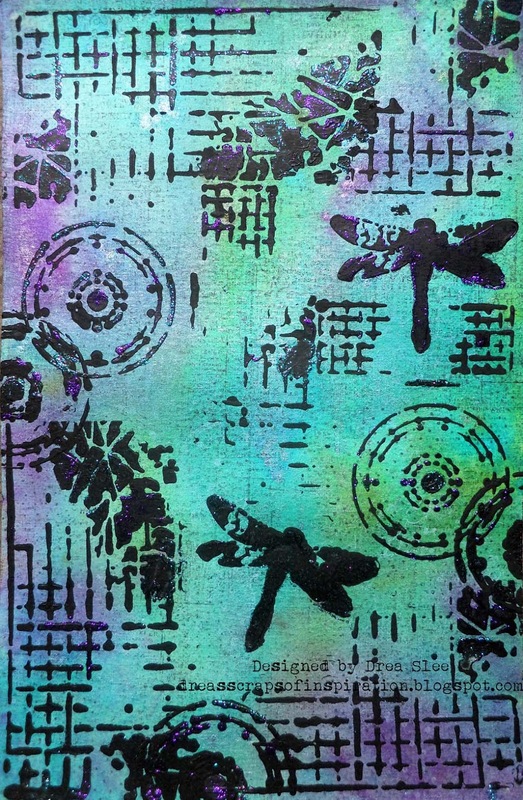 Once that was dry, I placed the same stencil over the gesso, and used my fingers to apply Stickles (Mermaid and Purple) for some sparkle, which really stands out over the black. 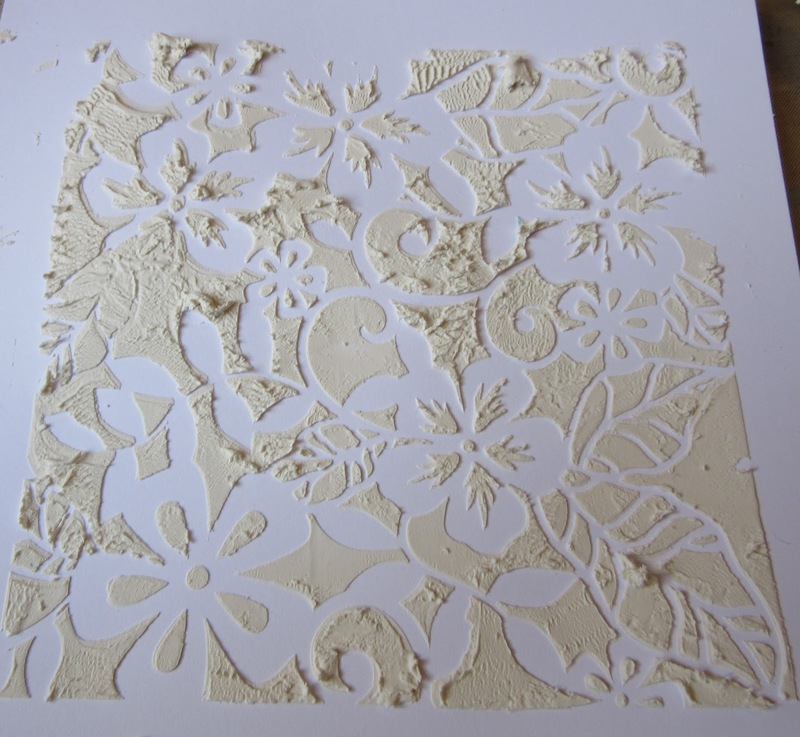 Finally for the Floral Frenzy fun, I took out some flower stamps, and embossed them all in black. 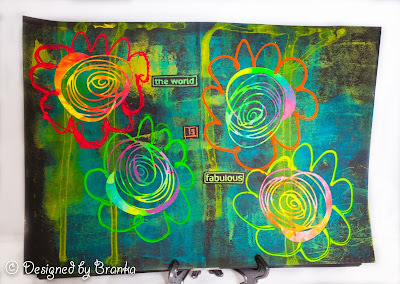 The largest flowers were stamped onto white cardstock colored with my Lindy's Stamp Gang sprays (Witch's Potion Purple and Tibetan Poppy Teal) and Prima Donna Purple Magical . Then I used a paint brush with the same colors to detail my flowers even more. 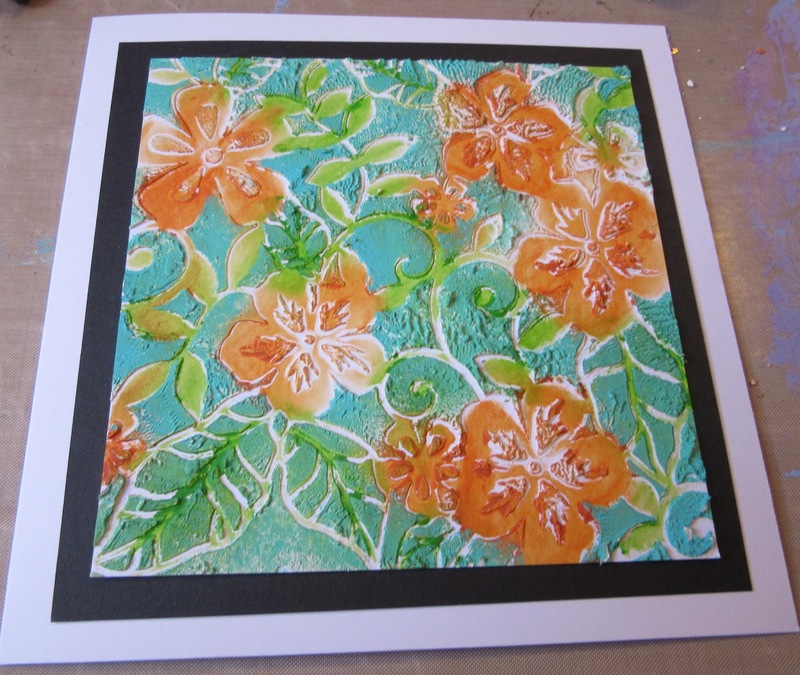 The other flowers were embossed onto white cardstock. 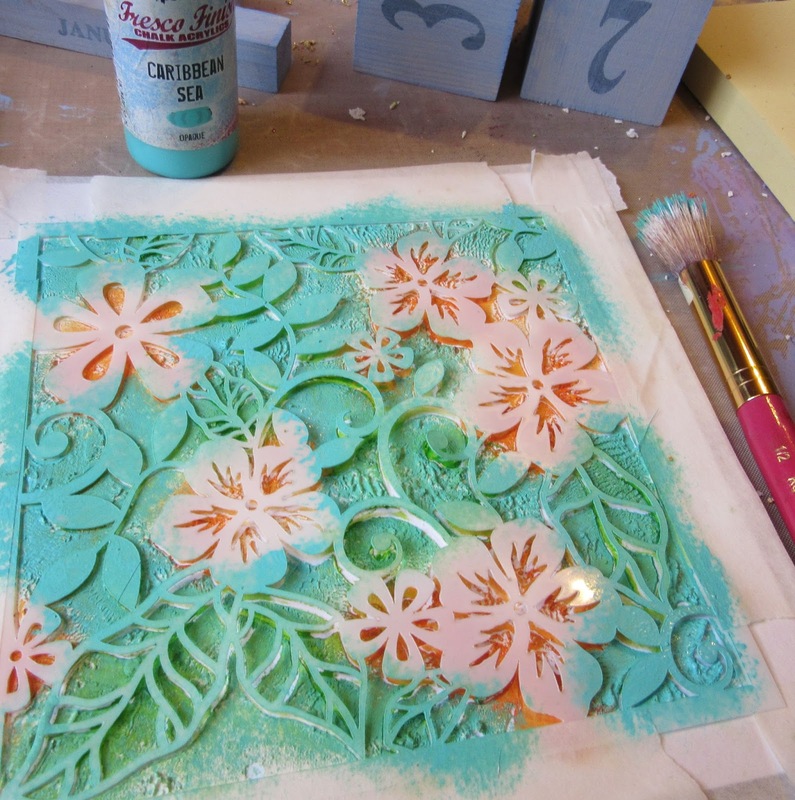 For the green flowers, I also used a paint brush to apply Lindy's Stamp Gang Sprays (Sea Mint Green, Tibetan Poppy Teal) and Drop Dead Gorgeous Green Magical for the centers. The yellow was painted with Distress Ink (Fossilized Amber). 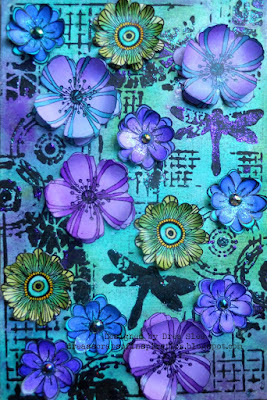 The smallest flowers were colored with Distress Inks (Wilted Violet, Blueprint Sketch, and Peacock Feathers), and finished with some Stickles (Turquoise and Starry Night) and bling. Thanks again Sue and the rest of the team for having me! 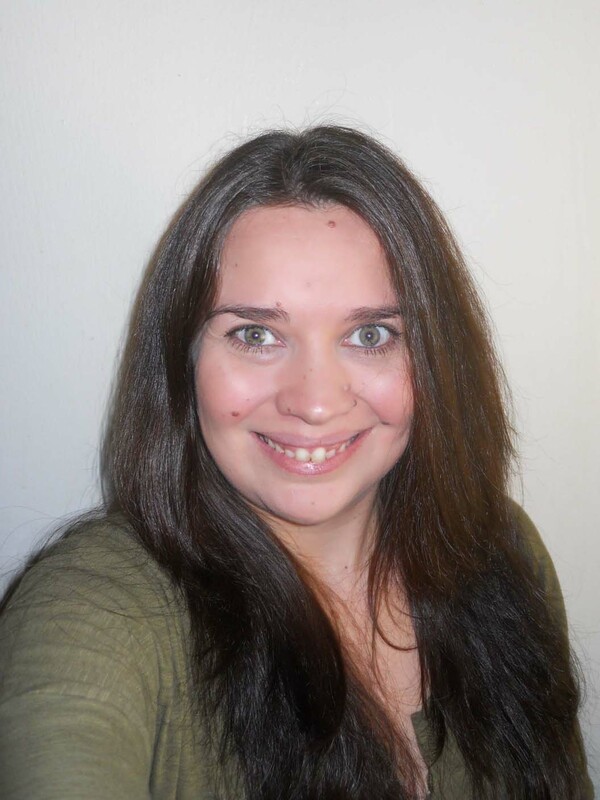 A big thank you to Drea for such a wonderful project ! 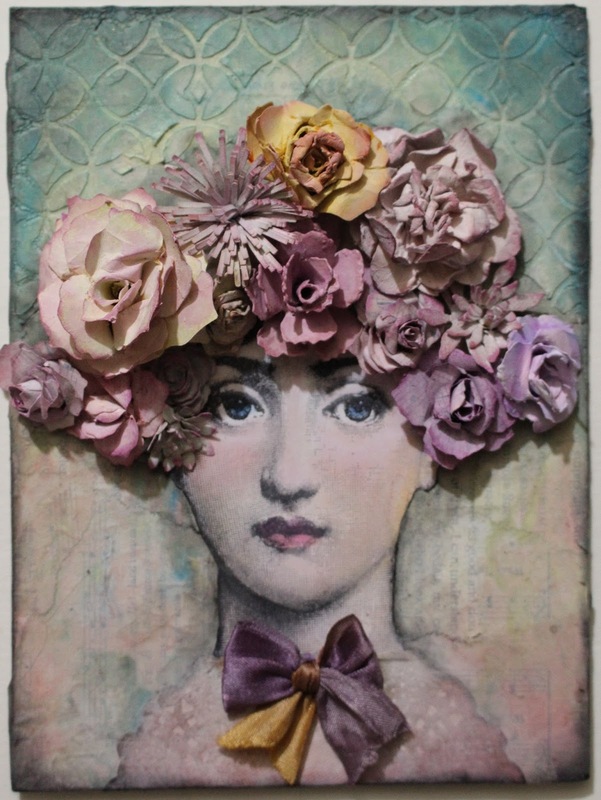 Loads more inspiration here for the current challenge Floral Frenzy which you still have plenty of time to join in ! Hi everybody ! 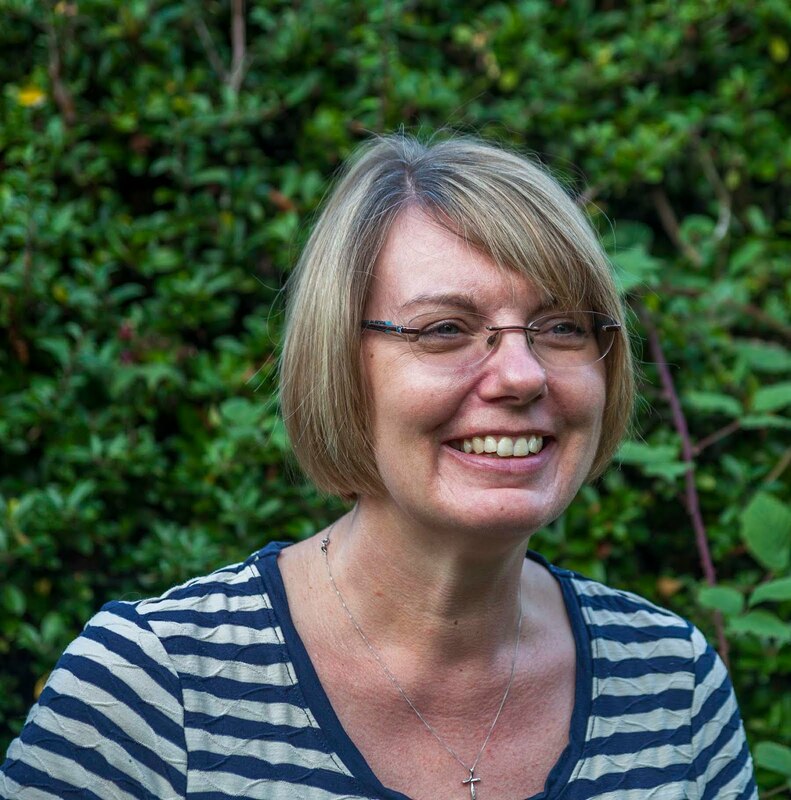 It's Toni here today, ready to share one of our Inspirational Posts with you. Here in the UK we are experiencing a typical British summer, a few days of sunshine, followed by a few days of storms and rain ! We love it. While the rain is pouring down, maybe you can stay inside and have a go at the little project I'm sharing, so that you will be ready for the next run of balmy summer evenings! 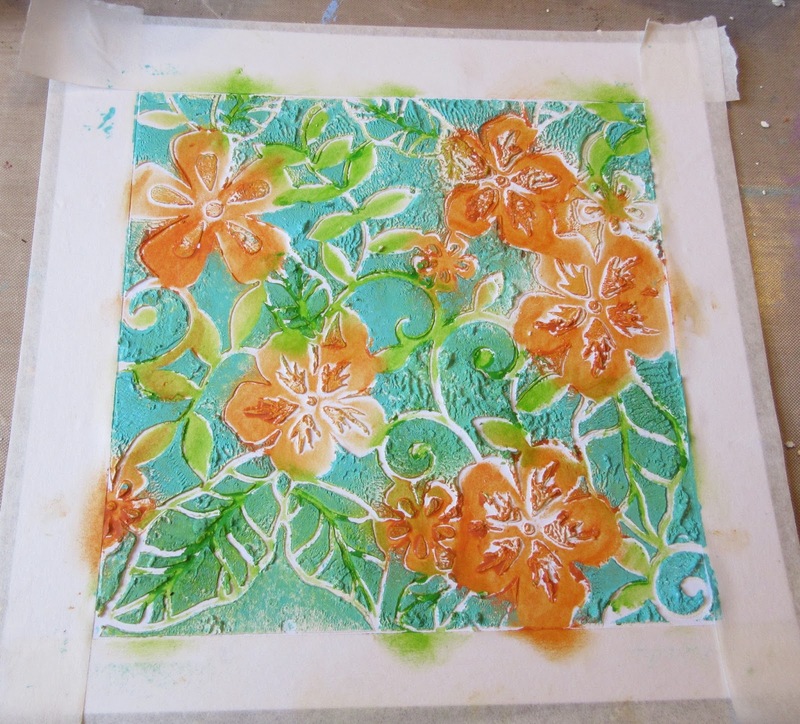 Stamping onto tissue paper is fast becoming a favourite with me. 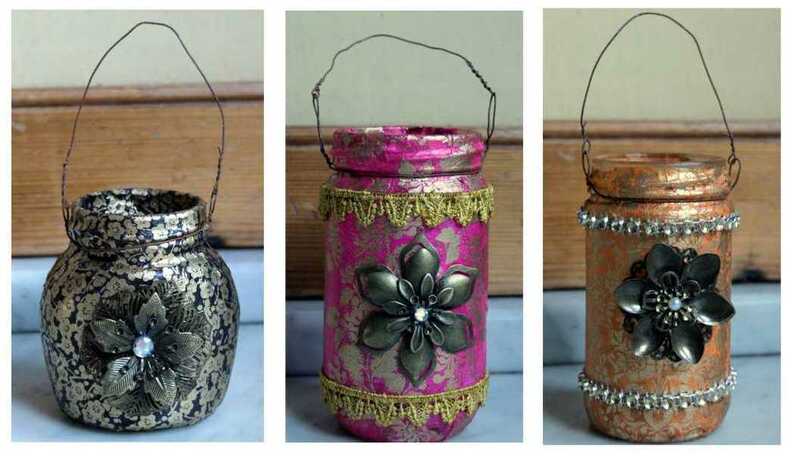 I love the way it can be used for transferring stamped images to different surfaces, whether they are flat or three dimensional.Here, I've used heat embossed tissue paper to cover some empty glass jars, to be used as tea light holders. 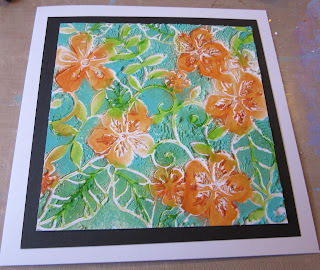 I chose pink, orange and black as I thought those colours would look luxurious with gold embossing. I cut each piece of tissue paper into a strip that was just a little wider than the height of each jar, and long enough to wrap around with a slight overlap. 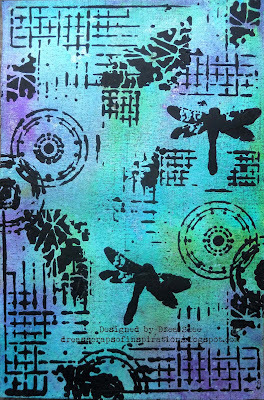 I used quite large background stamps, with Versa Mark Ink to create the patterns. 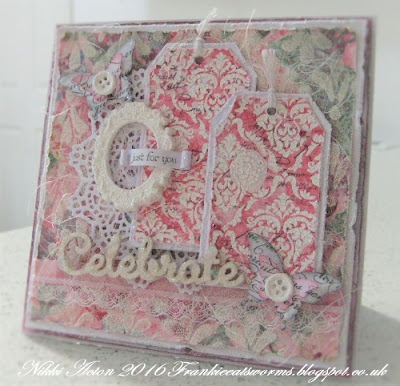 I heat embossed each stamping with gold embossing powder. Here are the finished papers. I really love the way the gold embossing looks against the coloured tissue paper. I then applied the tissue papers to each of my three jars using Deco Art Matte Medium. I'm afraid I forgot to photograph the jars before I got started and once I had started, the process was a little sticky. so apologies for the lack of pictures at this point. It is quite easy to apply the tissue. I coated the jars with matte medium and then rolled the paper around the surface. 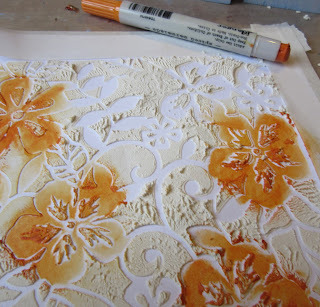 You need to work fairly quickly, as once the tissue paper starts to absorb. the glue, it becomes quite fragile. I used a bristle brush in a tapping motion, to gently coax the tissue around the 'shoulders', neck and base of my jars. I then coated the surface with more matte medium using my fingers to smooth over the surface. I didn't worry too much about any slight imperfections as they barely show on the finished pieces. Any rips or disintegrated bits can be easily patched. I think the tissue possibly shrinks as it dries and really bonds to the surface of the glass. 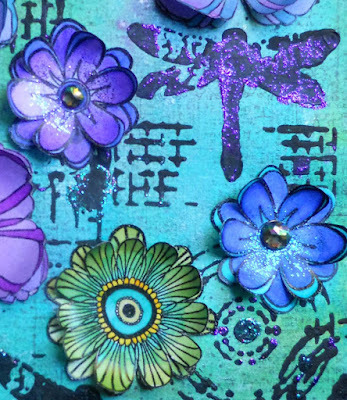 Once dry, I added embellishments using heavy body gel medium for the metal flowers and Glossy accents for the lace and bead trims. I also twisted some rusty wire around the rims and fashioned a handle to hang them up with. I started with a floral stencil from Indigo Blu and some grungepaste that I applied through the stencil. I removed the stencil and allowed the paste to dry. 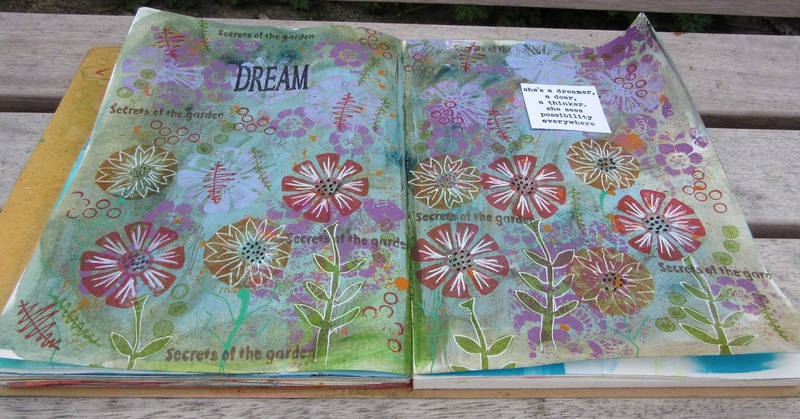 Next I used distress crayons and fingers to colour the spaces between the grungepaste. Next I added the stencil back over the top and pounced opaque fresco paint through onto the grungepaste. 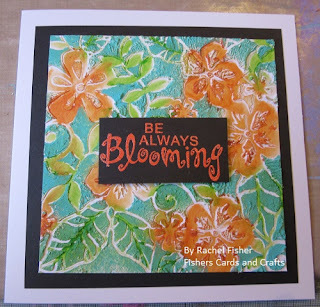 And finally I added the sentiment made by stamping the sentiment from Tracy Weinzapfel in versamark and setting in orange wow powders. I hope you have enjoyed seeing the process to make this card. Winners - Think Pink ! Drea if you hop over to Toni's blog you'll find all the details of how to claim your prize. 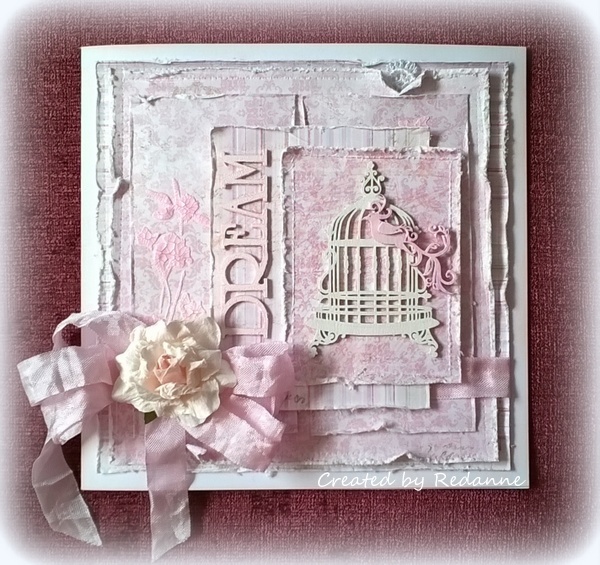 We loved the cascade of flowers on this beautiful card and the mixed media textured background. 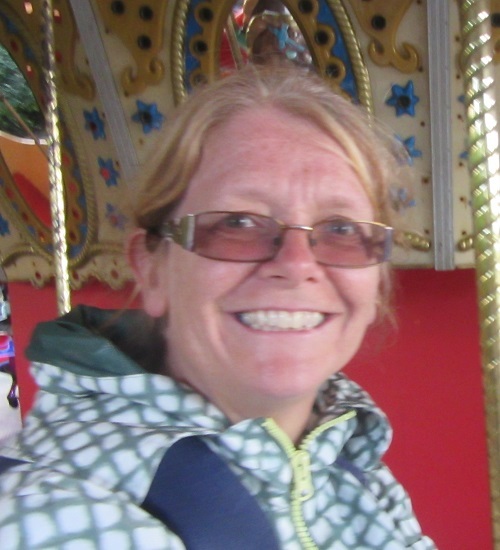 Lula please email carringtons22@yahoo.co.uk for details of your Guest Designer spot and winners badge. The current challenge is Floral Frenzy and you've still got plenty of time to share your floral projects with us. Hi everyone, Ruth here as the host of this months challenge and I'm hoping it's a sizzling June...a time when beautiful blooms burst into life. I adore flowers so whether they're stamped, stencilled or handmade we want to see flowers as the main focus of your mixed media project. Here are our floral creations to hopefully inspire you.